Stylish fidget mood ring that changes colors with every mood change, the inner bands moves while the outer band stays stationary. 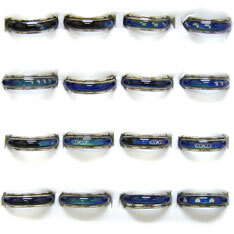 Inner bands have assorted designs on them such as dolphins, hearts, and moons. Sold by the card 60 rings per card with small, medium, and large sized rings. $29.75 per pack for 4 packs or more. $26.50 per pack for 12 packs or more.